A friend of mine in Hawaii LOVES American Idol and for giggles, I decided to watch the entire season with her, beginning to end. It’s my first full season and it’s been different than I expected. Frankly, I’m shocked at the lack of talent. Is it because it’s season 9? Or is it because pop music is really starting to bother me? 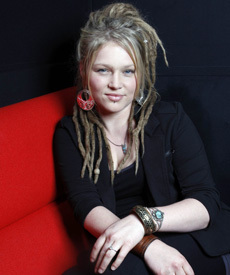 To be fair, there is a little talent – Crystal Bowersox is awesome. I’m a big fan and if she doesn’t win then everyone in America is dumb. The weird girl with the weird scream is good too but she’s more of an act I’d see at a circus as opposed to something I’d buy on iTunes. And the tall blonde guy is hot and good. And hot. I also don’t hate the guy that sings all raspy. He’s cute with a nice smile. But outside of those four, I have strong feelings of disgust for the remaining contestants. Tim Urban? I want to punch in the face. Paige? I’m glad she went home. She has pretty eyes but she was sucking it. And I can’t remember any of the other contestants. Yikes for them. But, if there’s one thing American Idol has given me this year, it’s Richard Lawson. He’s a writer for Gawker and after every American Idol episode, he pens a recap. And they are hysterical, witty, delightfully honest, and spot-on. And mean. He’s really mean and rude! He nicknames each contestant and makes fun of Ryan Seacrest every chance he can. It’s awesome. Richard Lawson‘s writing is close to flawless. He is one of the few talented pop culture writers published on the web today. As a writer myself, I’m continually impressed at his output and the ease with which he appears to write.